ROUND 13 saw Friday Night footy take centre stage, while the good old fashioned winter chill was in effect to greet the players on Saturday morning. Peel Thunder displayed their premiership credentials for all to see, while 2017 premiers East Fremantle put their hand up to be a contender once again. The Friday Night lights shined brightly on Subiaco as they put together four clinical quarters to thrash West Perth by 54 points at Joondalup Arena. The Lions got off to a start full of purpose by having seven scoring shots to two and led by twenty points at quarter time. Xavier Peacock kicked a early goal to start the second term that extended the visitors’ lead to 26 points. Alec Johnson finally got the Falcons’ first goal of the game ten minutes into the term, however, the rampaging Lions hit back hard with Peacock kicking his second for the quarter and Jack Mayo his second goal for the game. Lachlan Scurria kicked a vital late goal for West Perth to give them a semblance of hope for the second half. Subiaco were sharing the ball around nicely with 52 more disposals (183-131) and eight players in double figures led by Jacob Peletier with 18 disposals. Noah Clune kept up the late momentum that the Falcons had with a early goal to start the third term to bring the margin within 20 points, but Subiaco had all the answers yet again and responded through two goals each from Jack McIntoshand Sandon Page to give them a match-winning 47 point lead with a quarter to play. In the back of their minds the Lions would have been thinking about rebuilding their percentage which had taken a slight hit after a sizzling start to the season. The final term was a open affair and despite West Perth playing their best footy for the game just like they had done all evening, Subiaco had the answers kicking four goals to three to seal their fourth straight win and go to the top of the ladder – albeit with a game in hand over Swans and Peel Thunder who were due to meet later in the round. Unsurprisingly, Subiaco led all the major stats in a clear sign that they have their mojo back after their three game skid earlier in the season. What would make this victory even more satisfying for Subiaco is that West Perth thrashed the Lions to the tune of 59 points in round six. It was a terrific team effort, but Peacock stood out in the ruck with 39 hit-outs, along with six tackles and four goals. Mayo was a superb target with two goals to go along with his 21 disposals while Jordan Faroane was a live wire with three goals from 18 disposals. The midfield contingent were also in fine form with Tristan Hobley (29 disposals) Wil Hickmott (24 disposals), Zane Shellabear Healy (24 disposals) and Liam Hickmott (23 disposals) all finding plenty of the ball. Nathan Murray was once again terrific for the Falcons with 28 disposals which is his average across 12 games this year. 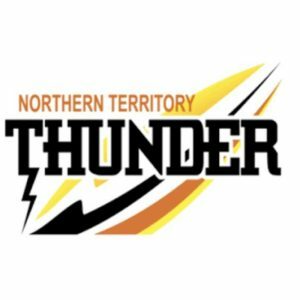 Peel Thunder underlined the fact that they are now the team to beat after thrashing Swan Districts by 62 points at Bendigo Bank Stadium. In this clash between two of the standout teams of the 2018 season, it was Peel who started the better with early goals through James Wiltshire and Ben Middleton. That was soon followed by majors from Billy Chambers and Jake Howes, leaving Swans in a early hole. Wiltshire then topped off a fine first quarter performance by the home side by kicking his second. Bottom age talent Jax Watson finally got Swans onto the board a few minutes from the quarter time break. The visitors continued to get into the game early through the second quarter as Sebastian Bright kicked their second goal of the game, and they were right back into it when Blake Pescud narrowed the gap to 11 points. However, Peel hit back hard with interest courtesy of two goals by Lachlan Cullen and another to James Sturrock getting the lead back to 30 points. The half time margin of 35 points pointed to the fact that Swans had a mountain to climb in the second half. However Peel was in no mood to let their rivals back into the game as they slammed on four goals to end the game as a contest. Wiltshire was proving a real thorn in the side of the Black and Whites, kicking his fourth while being given strong support by Middleton, who kicked two for the term. Incredibly, despite the differential in the score, Swans were still managing to get the ball into their forward 50, but were unable to find anyone to catalyse on the opportunities. 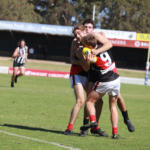 In fact, the visitors were held scoreless in the third term as Peel took a 77-point lead into the final term. Swans managed to wrestle a bit of respectability back in the final term by winning their first quarter of the game, but there is little doubt that with their seventh win in a row Peel Thunder are the team to beat, and they will be ready for another big challenge against second placed Subiaco next week. Meanwhile, Swans will want to get back to winning ways after two defeats in a row when they play a struggling Perth outfit. A sign of Peel’s efficiency was that they generated 25 scoring shots from their 42 inside 50 entries compared to Swan Districts, who could only muster 13 scoring shots from their 38 entries. James Wilshire was a clear example of true effective play as he kicked four goals, made three tackles and took two marks all from just eight disposals. Likewise, Lachlan Cullen was just as impactful with five marks and three goals from his ten disposals while Lachlan Riley took seven marks to go along with his 23 disposals and James Sturrock was strong with ten tackles along with 20 disposals. Joseph Hinder was best in a tough day for Swans with 25 disposals, seven marks and six tackles. East Perth won consecutive games for the first time in 2018 and moved to a game behind Perth in fifth place after defeating South Fremantle in a gritty low scoring encounter at Fremantle Oval. It was a dour affair in the first quarter with South Fremantle only kicking two behinds despite having nine inside 50s, while East Perth were kept scoreless. Rory Sparks broke the ice with a goal early in the second quarter and he soon followed that with his second of the game as the Royals went into the long break with an 18-point lead which felt a lot more in such a low scoring affair. Angus McKay finally kicked the Bulldogs’ first goal of the game early in the third term but that was quickly answered by Reuben Pasalich. South Fremantle continued to apply scoreboard pressure on their opponents with goals to Thomas Weston and Brett Pitt, but it was ball magnet in Thomas Baulch who topped off his hard work with a goal to keep the momentum with the visitors. Although the lead was a handy one under the circumstances, you just wondered whether the weight of inside 50s (31-14) would take its toll in the last 25 minutes as both teams were looking to make a strong push for the top five. Weston shaped as being a decisive figure in the final term and the key forward made a instant impact by kicking two goals to give the Bullldogs the lead for the first time since quarter time. However the Royals were not willing to let the four points slip out of their grasp and hit back with goals to Sebit Kuek and Pasalich. The Royals were then able to stay strong and withstand the Bulldogs’ attacks in the last 15 minutes and grind out a very important victory. In a statistic that will take a fair bit to top, the Royals won the game with only 19 inside 50s compared to South Fremantle’s 45. A sign of how keenly contested this struggle was is highlighted by the number of tackles in the game which was in East Perth’s advantage (101-92). Baulch willed his team over the line with 32 disposals, nine marks, six tackles and a goal and he was well supported by Jacob Msando with 29 disposals, seven marks and seven tackles. For the Bulldogs, Weston was terrific with three goals from his 16 disposals along with eight hit-outs. The only blot on his copy book would be the four behinds he kicked. East Fremantle staked its claim in the 2018 premiership race with a highly impressive 55-point win over Claremont at East Fremantle Oval. The Sharks got off to a blistering start in a rematch of the two top teams from 2017 kicking the first five goals of the game, with Zac Wilkinson kicking two of them. While the forward line was functioning effectively for the Sharks, their defence were coping with a flood of inside 50s from the Tigers (12), but they were able to only generate one scoring shot through Lachlan McKay. The Tigers started with intent in the second term quick goals to Jye Clark and Callum Jamieson. However, the Sharks were in no mood to let their opponents back in the game and they hit back through goals to Tom Wright and Ethan Brown, seeing them take a 26-point lead into the main break. East Fremantle put the game well and truly out of reach of their opponents in the third quarter with a seven goal to none quarter pushing the lead out to ten goals. The duo of Wilkinson and Dylan Curley was proving incredibly hard to handle for the Tigers defence as they each kicked three goals to that stage of the contest. Just like Swans did, Claremont managed to get some respectability back in the final term outscoring their opponents four goals to one, but it was another case of a team trying to play catchup after a very sluggish start and falling well short. East Fremantle now improve their record to 7-5 for the season and are very nicely placed to mount a strong defence of their premiership. Conversely, Claremont are in no-mans-land at 4-8 having struggled to get any momentum into their season so far. 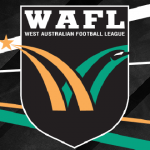 Unsurprisingly, East Fremantle led all the major categories, in particular dominating the inside 50 count 33-14 in the second half after trailing the Tigers by seven in that department after the first two quarters. The Sharks had impressive contributors all over the ground from Curley, Wilkinson and Brown all kicking three majors, to top-ager Cody Smith being strong in the contest with 21 disposals, five tackles and five marks. While for the Tigers, it was bottom ager Clark who could hold his head very high with 24 disposals along with six marks and a goal.